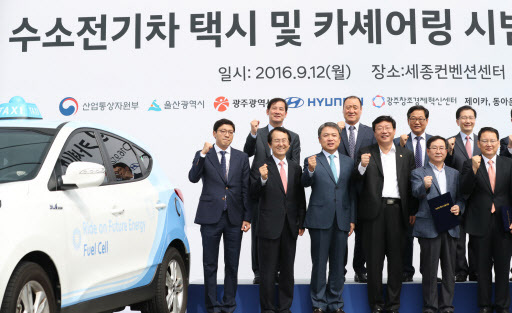 Hydrogen fuel-cell cars may eventually become a common sight on Korean roads as the government and the nation’s largest automaker Hyundai Motor are making efforts to spread usage of the new eco-friendly vehicles. Hyundai Motor said Monday it would launch taxi and car-sharing businesses with its hydrogen powered cars in the nation, a move which came a month after the government set up a control tower to boost the growth of eco-friendly cars. The automaker said it plans to start its pilot taxi business with the 10 Tucson Fuel Cell in Ulsan, a city in the southeast of the country, by the end of this year. It will then add 10 more cars in the city as well as Gwangju in southern Korea by the first half of next year. The business will expand across the nation in 2018 when the automaker’s new hydrogen fuel-cell car is launched. A total of 100 taxis will be operated in five cities, Hyundai said. “We hope the public can experience the eco-friendliness and the safety of hydrogen fuel-cell cars more closely,” Hyundai Motor’s chief Chung Jin-haeng said. “Hyundai will actively develop technologies to mass produce hydrogen fuel-cell cars and buses,” the chief added. Hydrogen fuel-cell cars, which require less charging time and travel longer distances on a single charge than electric cars, are currently not a common sight here because of the lack of charging stations and government support. Last month, the government announced it plans to increase the number of hydrogen powered cars to 10,000 units by 2020 and 180,000 units by 2030. It also plans to raise the number of charging stations to 100 by 2020 and 520 by 2030. Apart from the taxi business, Hyundai is also to start a car sharing business with eco-friendly cars from the end of this year in partnership with local startup J’car. J’car said it would start the business by using Hyundai’s 15 hydrogen fuel cell cars and 15 electric cars this year. It intends to expand the business in 2018 when Hyundai’s new hydrogen fuel cell cars are launched. An estimated 300 cars -- half hydrogen fuel-cell cars and the rest EVs -- will be used for the car sharing business by 2020. Hyundai Venture Investment Corp., a venture capital arm of Hyundai Finance Corp., and L&S Venture Capital will bear the costs, the company said. “Hyundai started the taxi and car-sharing business first because hydrogen fuel-cell cars are still too burdensome for individual consumers because of the high cost and the lack of charging stations,” Kim Pil-soo, an automotive engineering professor at Daelim University, told The Korea Herald. “The pilot business will serve as a testbed for Hyundai before it ships the new eco-friendly cars to the global market,” he added.